I've been putting off writing this post for several hours, as I was more interested in Instagram and antagonising my sister on Facebook. 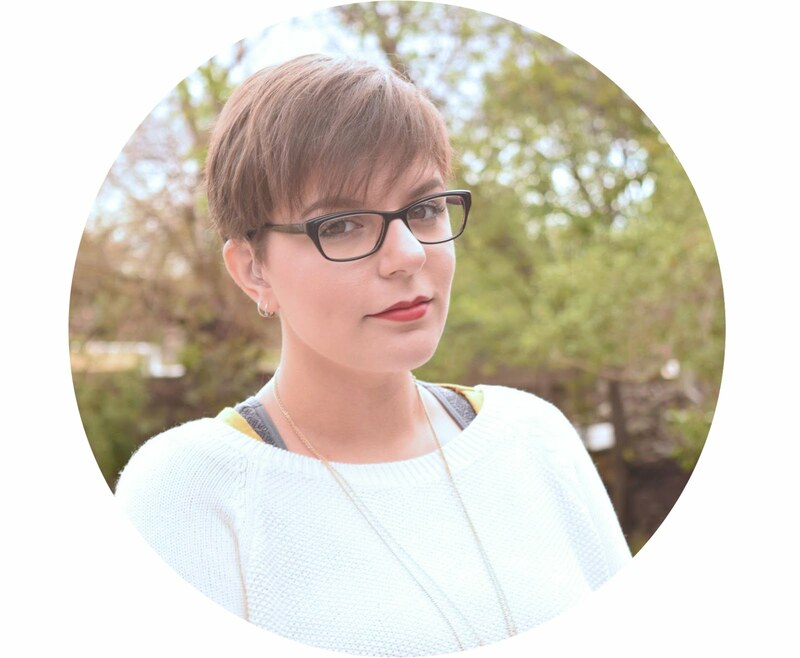 I think this whole Blogmas idea is more stressful than I initially thought, and I've been trying to keep up to date with the posts. I keep running out of ideas to write about, and then I'll find something and not be able to upload it until the following day because photos need to be taken. Such is the case with tomorrow's post, as I've yet to take photos for it, and won't be able to do so until Monday as I'm going to be out all day. Today I was in the city with my friend Funda for our birthdays. Normally we would hold it somewhere in the middle between our birthdays (hers is on the 18th of November) but we wanted to wait until the order from Makeup Revolution arrived. It arrived before my birthday but other things got in the way too. We had lunch at Rice Workshop and then chai lattes at Soul Cafe. Funda picked up theBalm Mary-Lou Manizer from David Jones and I was so proud of her, it's such a lovely highlighter! 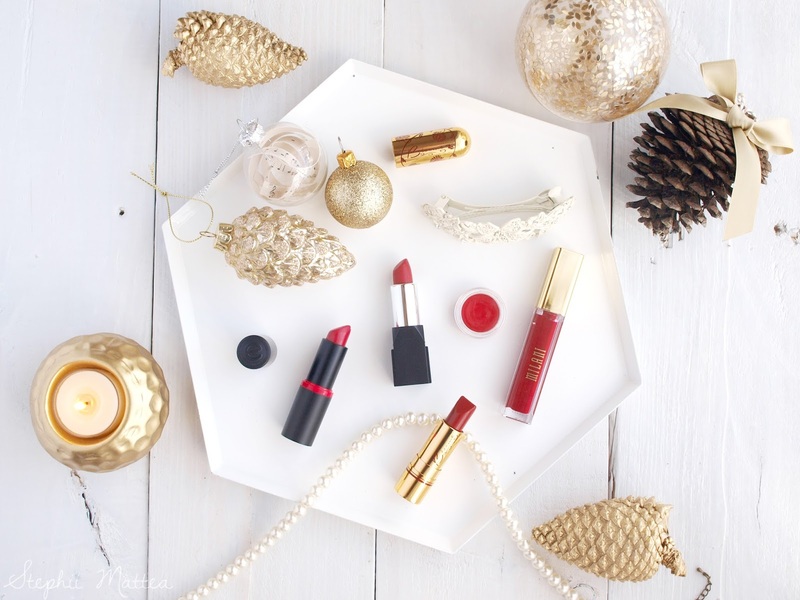 Today, I wanted to show you guys my picks for the best red lipsticks for Christmas. Looking back on my lipstick collection, I find that I do not have a lot of reds, just a whole bunch of berries and nudes. However, aside from the five shades that I'm mentioning in this post, I have a few other reds in my collection that I rarely ever reach for. I first tried this little beauty from a matchbook sample that Besame sent me, and I fell in love with it instantly. I actually wanted this shade way before I even got to try it as I found out that it was the lipstick that Hayley Atwell wears in Agent Carter. It's a warm red that is almost on the berry side, though it certainly appears that way in some lighting. This shade is perfect for everyday wear without being too out there. My review on this lipstick and the Red Hot Red shade can be read via this link. I got this sample when I first approached Besame Cosmetics for a few products to review on the blog, and while it's a bother to use a lip brush to apply this from the pot, it's a fantastic shade in that it's a vibrant red with a warm orange undertone that really makes your teeth appear whiter and it suits just about every skintone. It has a semi-matte finish and feels quite creamy on the lips. It's not kiss-proof, though it does last a long time. I look forward to the day I can buy this in a proper lipstick form because I love it. Now, this may say 'matte' but it really is not matte in any sense of the word. It has a sheen much like the Besame Lipsticks, though it feels a bit thinner on the lips. The colour lasts a long time, even after eating, and fades evenly without looking awkward. This is a brown-toned red which makes it lean closer to brick-red than blood-red. Nonetheless, this is also another perfect shade for everyday use. I've got a review right here in case you wanted to read more about the brand. Essence Long Lasting Lipstick in Adorable Matt! I don't wear this as often as I'd like, but it's a shade that I really like because it's super easy to apply, lasts a few hours without fading, and then fades gracefully. 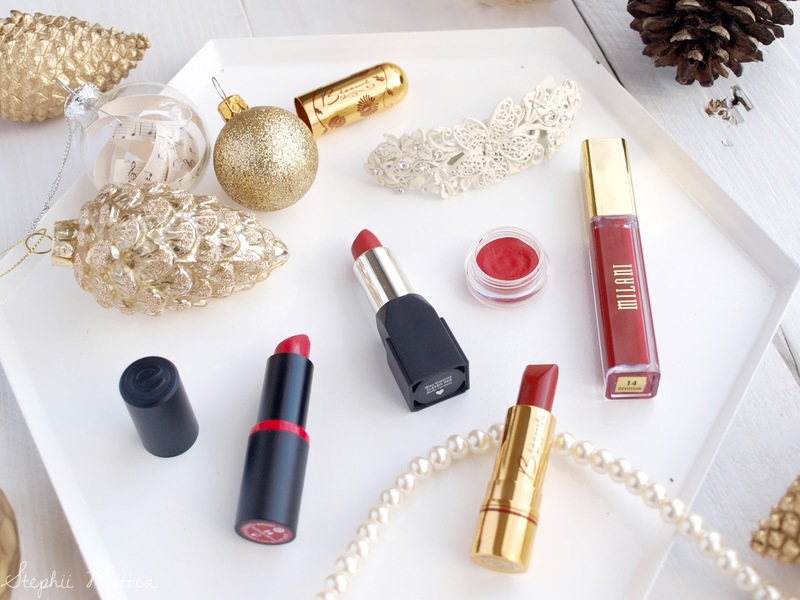 This is an easy red lipstick, though it has a tendency to smudge easily. This is a blue-toned red. Here's a review on the lipsticks from this brand. And, yes, my hair was long, and yes, my eyebrows do look a tad over-plucked! 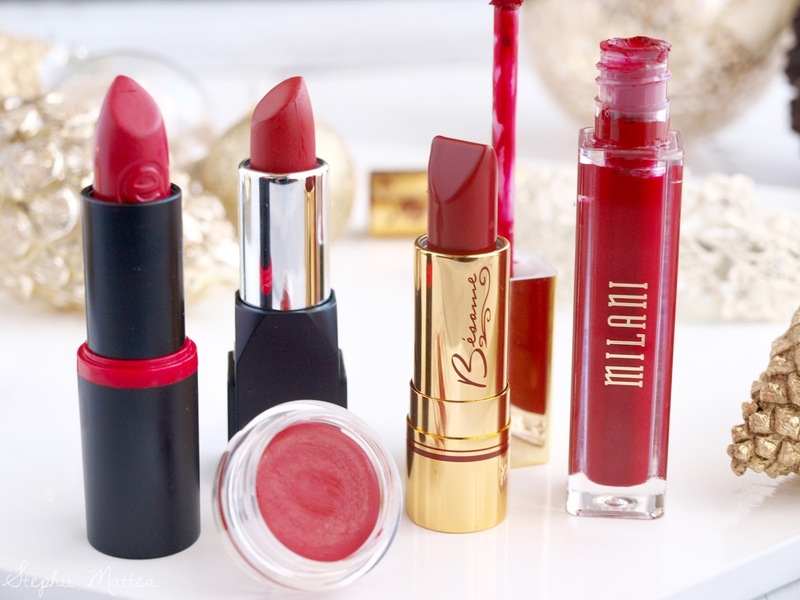 I need a day in which I can slap on some RCMA foundation, give myself a bit of a glow, do a black winged liner, topped with some gold, and then pucker up with that gorgeous red from Milani. I've yet to apply the Red Velvet lipstick from the tube, because I want to keep it looking pretty for as long as possible. 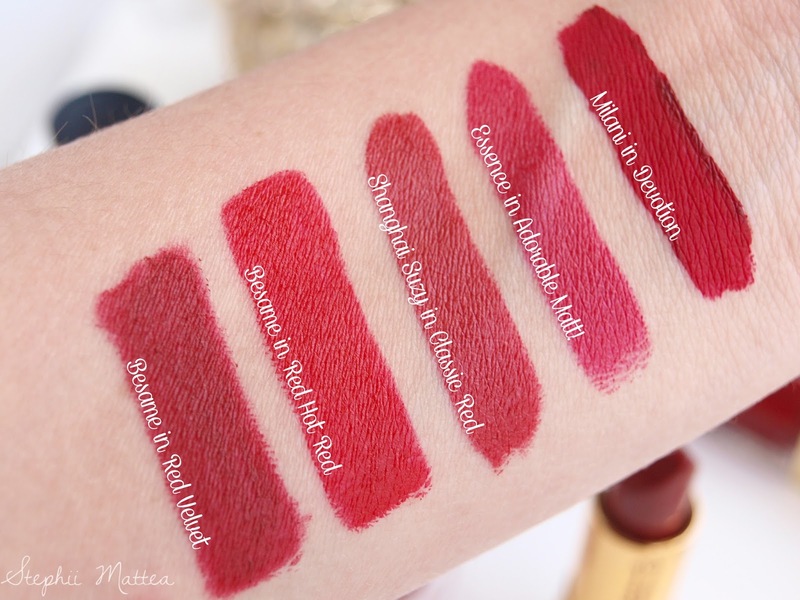 The swatch was from the matchbook sample that Besame sent several months ago, hence why it looks less than neat.